On her visit to Seattle, Madeleine Albright spoke with SPU faculty members, addressed a gathering of Seattle community leaders at the Downtown Business Breakfast, and met with members of the SPU community. On stage in Seattle Pacific University’s Royal Brougham Pavilion, former U.S. Secretary of State Madeleine Albright pointed to the gold pin on her jacket. “This is my attempt at a falcon,” she said. 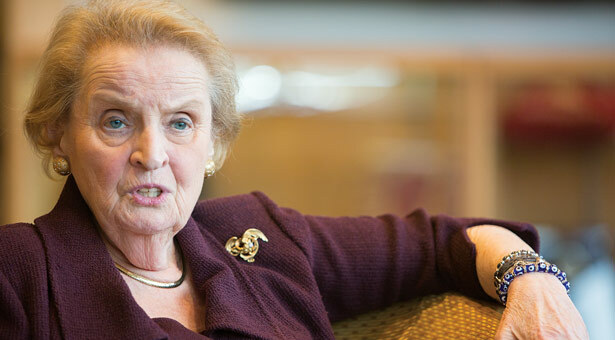 Albright is known for using her pin collection to comment on her circumstances, a practice she began when the Iraqi press called her an “unparalleled serpent.” At the time serving as U.S. ambassador to the United Nations, Albright donned a golden snake pin, in defiance of Saddam Hussein’s regime. 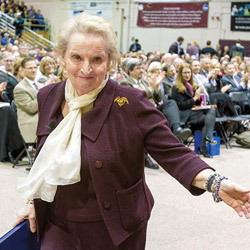 Albright visited SPU on April 3, 2014, and gave a public lecture to a standing-room-only crowd of 1,800, arguing for the value of civil discussion as a tool for solving global problems. The next morning, Albright spoke to 1,100 business and community leaders at SPU’s 18th annual Downtown Business Breakfast about the challenges facing the global spread of democracy. In addition to her service as secretary of state, Albright is the former U.S. ambassador to the United Nations, and a former member of the U.S. Cabinet and National Security Council. Author of five New York Times best-selling books, she teaches at Georgetown University’s School of Foreign Service and is chair of both the National Democratic Institute and Partners for a New Beginning Aspen Institute Middle East Programs. Ediger: As the first woman to serve as U.S. Secretary of State, you’re known for a very strong voice in politics and an advocate for women. What advice would you give to our students, especially the female students who are searching for their own voice, who often find it difficult to speak out? Albright: When I first started teaching, I went to Georgetown University. I wanted to educate women to be capable to operate in foreign affairs, which obviously means you have to work with men. And then some man says it, and everybody thinks it’s great, and you’re so mad at yourself. In order to speak in a meeting, you have to listen with the expectation that you’re going to talk. What I started doing in my classes was to say all students had to interrupt, they didn’t have to raise their hands. My classes were a bit of a zoo, but I think that it’s a different kind of approach. Then I saw the sign for the United States and I thought to myself, “If you don’t speak today, the voice of the United States will not be heard.” And so I think that women have to make themselves talk. Drozdova: Many of our students are interested in careers in foreign service, international relations, national security. What do they need to study to prepare now in order to lead the free world going forward? Albright: Let me tell you something, it’s totally different today. When I was at Wellesley, I was a political science major. I always took a lot of history and economics. Now the field is huge. Our students now have to have an understanding of science. They need to understand there’s so many different parts of what you can do; you can do health issues, you can do food security. You need to understand water politics, technology and cyber threats. I think it’s just a much more complicated field. If I had anything to do with setting up a curriculum, I would insist that people had science and health policy, and look at it in terms of the problems that have to be solved. It’s much more interesting, meaning I think that there’s a much greater variety; and you can have people with different talents. It’s a growth industry. And, obviously, knowing languages makes so much difference. Drozdova: Among the hot spots in the world right now are Ukraine, Russia, and Crimea. [Russian President Vladimir] Putin has made comments that the situation in Crimea is, in his view, similar to Kosovo. As someone who was critical to American and Western decision-making during the Kosovo crisis, how would you evaluate that statement? Are there any similarities? What are the differences? Albright: Like you, I’ve spent a large portion of my life studying Russia and the Soviet Union, and I think Putin is living in a parallel universe, having completely made up his own set of facts; and I don’t know whether he actually believes everything he says. First of all, we spent years negotiating through a number of different diplomatic tracks, to try to figure out how to do things peacefully. And we tried everything possible to get Milosevic to pull the troops out of there. There was a Security Council resolution that had said, in fact, that the situation in Kosovo was a threat to peace and security. We tried to get a U.N. Security Council mandate for having a peace-keeping operation in Kosovo. The only similarity is that Kosovo, in terms of Serb history, is similar to Crimea in terms of Russian history. I think the history of Crimea is clearly a large part of Russian history. Ukraine itself is complicated. But changing borders with arms is not the way to do it. Ediger: In your book The Mighty and the Almighty, you describe how religion and politics are inseparable. How might the relationship between religion and politics be used for good, both by governments, such as our own, and by individual citizens? Albright: One of the things that was hard for me to believe was that when I first started both at the U.N., and then as Secretary of State, and we were dealing with Northern Ireland, that it was possible for there still to be religious wars at the end of the 20th century. And then the whole issue with the Muslims and the Balkans. thought I needed to write a book that showed that given what the end of the 20th and the 21st century were like, people had to understand the role of religion in terms of international relations, and the kinds of things that happen because people don’t understand each other’s religion. My own religious background is fairly complicated. I was raised a Catholic, married an Episcopalian, and found out I was Jewish. I think that it is essential for people to understand religious backgrounds. And so what I really came out with in that book was that our diplomats, in addition to learning the language and the history, need to understand the religion of the countries that they go to. I think people need to know what they believe in themselves, but also learn respect for other religions. Drozdova: You have often spoken about [former Czech president] Václav Havel as a person of great moral authority. What did you find so inspiring in his life and moral leadership? And what might modern leaders learn from him? 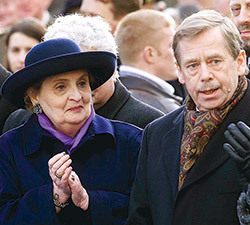 Albright: What I thought was so amazing about Havel was his capability of maintaining his moral stature, despite all of the things that were going on around him. What I found interesting about him — and the same thing is true of Nelson Mandela, and to some extent of Aung San Suu Kyi — is that they were all able to forgive their jailers. And I think forgiveness is a very important part, because you can get totally consumed by hatred. Havel was unbelievably humble. And I still am so sorry he died, because we spent a lot of time together. We got to be really good friends. He kept wanting to do more. I think the sad part is that people in the end didn’t quite recognize what a brilliant leader he really was. He was remarkable. Drozdova: In terms of American foreign policy, from your time to the present, what are we doing better and what are we doing worse? What do we need to be doing? Albright: I think it was a huge mistake for Americans — President Reagan and President [George H.W.] Bush — to say we [the U.S.] won the Cold War. The truth is they [Russia] lost the Cold War. It’s not just a semantic difference, because partially what it has done is allowed President Putin to blame the West for the destruction of the Soviet Union, which he thinks is the greatest disaster of the 20th century, forgetting about World War I or World War II. So President [George H.W.] Bush, who was the first one there when the Soviet Union dissolved, and then President Clinton, were trying to figure out how to do something that had never been asked by anybody before: how to devolve the power of your major adversary in a respectful way, when usually you beat them on a field of battle. I can’t tell you the amount of time we spent respecting Russia. We created the G8; we helped them during their financial crisis; we all spent an incredible amount of time. We did expand NATO, because nobody wanted to be in the Warsaw Pact; it fell apart on its own. And countries that had been forced to be part of the Soviet satellite system wanted to be in NATO. I personally went to Moscow to talk to President Yeltsin [about NATO]. And I said, “Mr. President, this is a new NATO. It is not against you. You are welcome ultimately to be members of NATO.” I negotiated the Russia-NATO Founding Act. We did everything we could in order to try to bring Russia into the system. We were operating all through the ’90s in terms of trying to get Russia into NATO. I think the problem at the moment is Americans are tired of Iraq and Afghanistan. There are American cities that are in bad shape, and they have questions about our education system. So I think we’re having problems putting together the domestic and foreign policy. We do need to be partners with other countries; and I think that’s a hard part. It’s a very complicated time. I happen to be somebody who believes in a strong role for the United States. I’ve said it so often that we are an indispensable nation, but there is nothing in the word “indispensable” that says “alone.” It just means that we have to be engaged. Read a review of Prague Winter by Madeleine Albright, and find out how you can request a copy.